Powerful Website Design That Simply Works Better! When Webstix was founded in 2001, most websites were simply brochures. Their main functionality was limited to a form on the Contact Us page, or perhaps a small store. Nowadays, websites connect with back-end systems to streamline your business processes, which increases operational efficiencies, driving down your costs to increase profits. Today your prospects expect more. Along with other online conveniences, they want to order on their smart phones, receive email updates, have their shipments tracked, and get fast delivery. If your company’s website does not fulfill these expectations, you risk losing business to competitors who have websites that do. The day of the single-person website company, prevalent as recently as ten years ago, is very much over. Building an effective business website nowadays involves much more than “only” graphic design and coding. For example, maximizing a website’s search engine optimization (SEO) and/or “pay per click” functionality is a profession unto itself—and we have experts on staff who deal only with that. Similarly, integrating your e-commerce system seamlessly into your website design requires a team of professionals who are expert at working collaboratively across disciplines. Quite frankly, given industry trends, the one-person Web-provider who builds your website today probably will not be in business tomorrow to help you with its maintenance or updating. Website graphic design has changed significantly over the past ten years. Driven by the smart phone revolution, the style today is much more streamlined, linear, and two-dimensional to accommodate smaller screens. This adds to the challenge of good graphic design: providing the most user-friendly experience and maximum functionality while simultaneously maintaining your company’s graphic identity—all with fewer design elements! Beyond excellent artistic ability and esthetic sense, getting all that right requires a graphic designer who knows how to build a “human interface” that is not only beautiful but that also maximizes the user-experience so that your website is easily used on any device—large or small. We have an enviable record of building new websites that are virtually problem-free at launch. Although ours is an agile approach, we nonetheless incorporate a comprehensive system of checklists, policies, and procedures to ensure that no step is initiated in the building process of your website until the ones logically preceding it are problem-free and fully functional. Of course, this takes time. But we do not aspire to be the fastest or least-expensive website builder available to you. We would rather be the best. If you think hiring a professional can be expensive, just wait until you hire an amateur to do the same work! So What Makes Your Business/Organization Different? Most websites out there that have been written by people inside the company do not adequately answer this question. They put all kinds of time and money into their website and they miss the most important thing! They don’t clearly state to their customers why they are different from their competition. Don’t make this crucial mistake. Our copywriters work to first pull this information from you and then then frame it in such a way that is powerful and it cannot be ignored by your website visitors. Our websites work better not just because we set them up right (technically) but we ask the right questions and craft it so that what people see is POWERFUL. Let’s face it, a lot has changed since we started building websites back in 2001. Today, there are more tools available and just about anyone can build a website pretty easily. Some places will even build you a website in a matter of hours. A quick website does work – we get that – but does it perform? The problem with that question is that you won’t know… until it’s too late. Another question is, do you want a website that is just as good as what your competitors are doing or do you want to be miles ahead of them? Who do you think a person doing a web search will choose… the apparent leader or just a follower? At Webstix, we take your website very seriously. We go beyond just asking “what colors do you want?” and we find out how your new website can actually grow your business, providing true return on investment. We have numerous protocols, procedures, checklists and endless testing to help ensure your website launch goes off without a hitch. Our employees have more years of combined expertise than any other website design firm in the area. You’re getting true experts using a proven system – along with individualized consultation (built-in) – to give you a website and get you traffic that can be a turning point for your business. Clients that partner with Webstix and are willing to invest in their website see results. Sure, an online website builder or a website built in a few hours will do alright. Sure, there are some good things built in when you use that option and it might be the right solution for some businesses. We’re not going to say that every business out there should use Webstix because that wouldn’t be true. You and your website designer need to be in a “win-win” situation/agreement so that you both get what you need to be successful. To build a website that simply works better takes, you guessed it… work. It’s hand crafted by experts with years of experience – not a firm hiring freelancers from here and there. You want a team like Webstix has who study your business and delve into the intricate details of how your website needs to be set up in order to give you the results you need. To do this, we offer expert copywriting, expert promotion and expert research. This becomes the foundation of your website. From there, the design team puts together the blueprints (wire frames) of your design. Your design and website are then built. 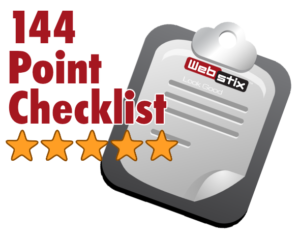 Our team then goes through a 144-point checklist when we set up and launch your website. This checklist is something we’ve built since we’ve been in business since 2001 and no other website company anywhere has this list! We take care in launching your website so that search engines love it. When they do, you rank higher. We’ve also learned that we need to stay on top of the latest web technology and what search engines want. We don’t benefit when our client would come back to us and ask why we didn’t do something that seems like it’s something every website design company should do. Instead of being behind the times on those things, we decided to be ahead of them. We include everything that should be done for a website to be made the right way. The only time we don’t do that is because a client might decline certain things but we always ask and explain why it should be done. This kind of careful attention to detail isn’t something that can be done with any of these online website builders or companies that build and launch your website in a day. If you want fast, then use those method but that’s just not how we do it – we want our clients’ websites to work very well, and rank well, without problems. People using these kinds of quick website design methods may later find out that their website didn’t have a number of things on it that it should have. They find their competition is ranking higher because their competition didn’t build their website the cheap way. By “saving a few bucks” your competition has an opportunity to rank higher than you. Do you really want to risk that? 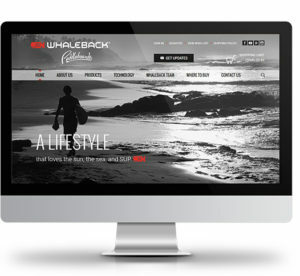 Our clients want return on their investment and with Webstix, their websites simply work better! Technically, your website needs to be set up right utilizing the latest technologies to give you every possible advantage. Have you used Apple’s Siri or Google or Alexa to do a search? That’s voice search. Your Webstix website will be crafted in such a way as to give your website an advantage when it comes to becoming a result (source) for voice search results. With more and more devices being used to gather information, make sure your website stands out as a trusted and valuable resource to send traffic to. Using PHP 7 for your WordPress website is more secure and it greatly increases speed. We can create your new website using PHP 7 so that you are providing the best user experience possible. Fast loading websites rank better because Google sees that your website is providing the best user experience. This is one factor to ranking better than your competition. Google also wants to see all websites be secure. This means all communication from a website to someone’s computer should be encrypted. When this is done, the chance of any information being intercepted is very, very low – almost non-existent. 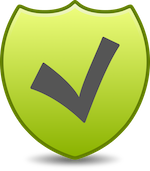 When you provide your website visitors with a secure connection, that is also improving the user experience. Eventually, all websites will be secure. Now is the time to take advantage of this technology before your competition catches on. From an SEO (search engine optimization) perspective, do you know the 100 or more factors that will give your website a chance to rank higher? 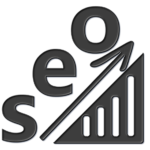 Choose a website design company that knows SEO factors inside and out and keeps up with the latest changes. We’ve set up loads of WordPress websites and we’re a plugin developer. We’re experts at several theme frameworks like Enfold and Divi. We’ve done extensive research on how to create WordPress websites that load quickly. We’re the best in our area for sure. We do WordPress website maintenance and updates (see our Website Care program) and we do WordPress website hosting. We support WordPress and offer training at our office almost every month. Most of our projects are for our web design services (consulting, wire frames and design) and a content management system like WordPress or Magento for E-Commerce but we have some projects that are just design. If you have your own system (programming, etc.) 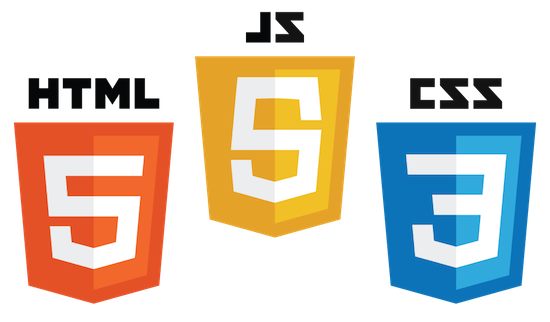 on your website, we can just do the website design and code to HTML, CSS and JS if you like. We’ve done many projects this way – both for our clients and even for other agencies in town. Maybe you have your own IT Department that built a great website but the design isn’t measuring up and it needs a facelift. Webstix can help with that. 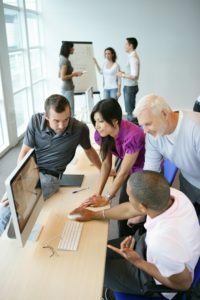 We can work with you on a design project, code it and then provide integration instructions for your team. They can then easily apply that new design template/theme to your own system, improving the design of your website – or even making it mobile responsive if you haven’t taken that important step yet. 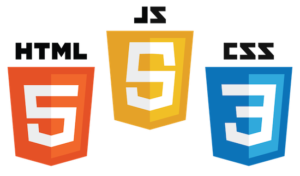 So if your website doesn’t require a lot of changes to the content and you have a smaller budget, then going with a static HTML website can make a lot of sense. We can even give you the ability to modify some content on some pages without using WordPress. When we launch your website, it’s not over... in many ways, things have only begun! Do you want to know who is coming to your website? Do you want help capturing those leads? Do you want ways to get more traffic? Do you need help managing your website? Webstix provides our client with the help, support and training to work with you and your business going forward. We’re your partner, helping you succeed. We can provide fast hosting, secure websites, website training, website promotion services, online/offline advertising, systems integration and more. We have a dedicated website maintenance team who help our clients with smaller requests. We do not take developers off their projects to take care of smaller requests or go hire freelancers. Instead, we have team who just take care of smaller requests and do support. The result is that we get things done faster and with better results/accuracy than our competition. We track all requests and follow up on open tickets daily. Hey, you have your own business to run. We’re there to support you on the website side of things so that you can do what you do best – run that business! See what our clients are saying. Head over to our testimonials website – Webstix.rocks! If you like what we’re saying, then contact us and let’s get a conversation going. There’s no obligation.